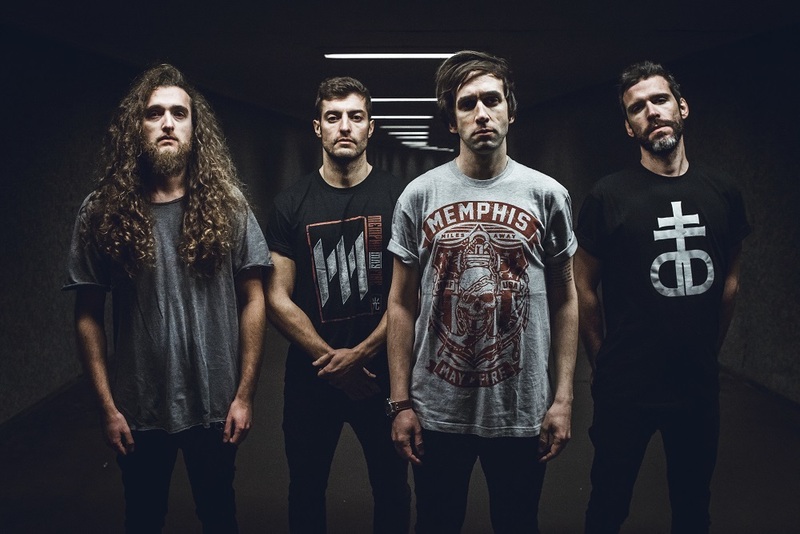 Alternative metal band Nowhere To Be Found released their debut album Safe Haven in 2016, but changed their line-up in 2017 to become a quartet with João Quintais (lead guitar) joining and a new, heavier sound. Ahead of their second album, they will release single ‘Traverse’ on Wednesday, February 7th. We caught up with the group to find out more. The easiest way to describe [our style] would be alternative metal, maybe because instrumentally we are close to metalcore, but then the voice is closer to alternative rock. First up, tell us bit about yourselves - what led you all to forming ‘Nowhere to be Found’? The band started unpretentiously, with no idea we would be where we are today. It just started with three high school friends who decided to get together and play some covers. This day led to a set of projects with different vocalists and some setbacks that took us to a hiatus. A year later we decided to get together again and start making jam sessions, which quickly led to the creation of a set of originals that we decided to show to the public. The result was quite positive and that led us to record our first album Safe Haven. At some point we noticed our songs, like ourselves, had evolved over time to the point we felt it necessary to add another guitar, the sound screamed for it. With this addition Nowhere To Be Found were born as we are today. That’s very difficult to answer, although we have some bands that we all like, each one of us has its own influences, from our drummer’s Ska-Punk, to the bassist’s industrial rock, to grunge/nu-metal of our vocalist and the metal of our new guitarist. We are a small melting pot of influences. Why the name ‘Nowhere to be Found’? To be quick and precise, this decision came from the change in the band’s identity. After long hours of discussion, we decided to drop our old name (insch) and leave it where no one could find it. And so the Nowhere To Be Found was born. This is a complicated question to answer, for we never know where we fit - and people often tell us just that. The easiest way to describe it would be alternative metal, maybe because instrumentally we are close to metalcore, but then the voice is closer to alternative rock. Tell us about your single ‘Traverse’, out February 7th. What’s it about? ‘Traverse’ speaks about an abusive relation, although the lyrics can fool one into thinking it’s a love story. It’s about someone in a toxic relationship who refuses to change for the benefit of both and still lures the other one into sticking to that relationship. We’ve all been there, right? When did you write ‘Traverse’ and where did you record it? We wrote it as we write all our songs, in our rehearsal studio in Ericeira, by the beach. We write everything together. We recorded it at Wrecords Studios, in Seixal, just a little south of Lisbon. ‘Traverse’ features Matty Mullins of Memphis May Fire. How did they get involved? If there is a band that we all like, that band is Memphis May Fire. To be honest, when we sent the email with the invitation to Matty, our hopes for even an answer were minimal, which left us all even more amazed when we received the reply two days later: he liked the song and would gladly sing on it. It was literally a dream come true. He’s truly an awesome guy and great human being! What did Matty bring to the single? We gave Matty complete freedom to sing and add whatever he wanted wherever he wanted. We did not impose any conditions, as he is an impressive and creative vocalist. The result was brutal. Matty has a special way for harmonies and gave his personal touch to the song, which was what we really wanted and the song needed. How does ‘Traverse’ represent your style? If you listen to our first record, ‘Traverse’ represents a big evolution. One could say ‘Traverse’ is the best representation of what we want to be as musicians. Heavy riffs, catchy choruses, meaningful lyrics. What are you hopes for ‘Traverse’? We expect ‘Traverse’ to be the kick in the door that we need to reach the next level. Maybe as a result of singing heavy rock music in English, we don’t feel a lot of support here in Portugal, we love our country, but our industry is quite closed in its niche, leaving bands like ours aside and fighting to reach something bigger. Our hopes are ‘Traverse’ can represent bigger stages and a spotlight for ourselvesl and for other small bands in smaller markets making great music. What are your plans for 2019 in terms of touring and further releases? In 2019 we will definitely release more singles and our new album, it’s much more mature and heavy, so we are eager to see the fan’s reactions. Regarding the tours, we are also organising a small national and international tour first - it is not easy to organise all this by ourselves, but at this point we have to make ends meet as we can, we don’t have a record contract or a booking agent! We wouldn’t change anything greatly, maybe start sooner on the fight. Everything we’ve been through has made us grow up and learn how everything works around music, but has also brought us closer together as a family. It is true that we could go around some setbacks we picked up along the way, but it would not prepare us for when the bad news came up… and a few came up, but it never moved us away from what we believed. Watch the video teaser for ‘Traverse’ on YouTube below. For Nowhere To Be Found news and your dates go to ntbfofficial.com.